Over the weekend was the Chicago Dental Society’s Midwinter Meeting at the McCormick Place! It was the Society’s 152nd Annual meeting. This meeting attracts attendees, presenters, and dental vendors from all corners of the world. 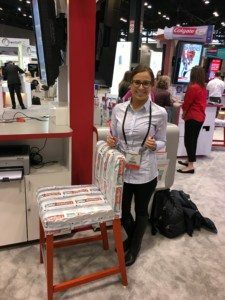 Sugar Fix Dental Loft’s latest addition, Leah Paskero was one of the many friendly dental hygienists in attendance at the convention. Leah spent the weekend learning about all the new latest and greatest gadgets in the dental field. This includes some of the cutting-edge technology that is already in place at Sugar Fix Dental Loft. 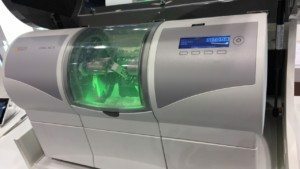 Leah received a hands-on demonstration with the Computer Aided Design and Manufacturing (CAD-CAM) Technology. We use this to do same day dentistry, like crowns and smaller restorations. During this demonstration, she furthered her skills and knowledge with the same day production of crowns. The Midwinter Meeting sure was a great learning experience for Sugar Fix Dental Loft’s hygienist, Leah Paskero! The most exciting part was walking around the exhibit hall at the Midwinter Meeting and representing Sugar Fix Dental Loft while meeting all the friendly manufacturer’s representatives. There is no better way for the representatives to learn what Sugar Fix’s friendly moto, then during a one-on-one interaction. One of the best places for this personable experienced to happen is at the Midwinter Meeting! During one of these excellent occurrences, Leah was given the privilege of networking with the representatives at Colgate. Then, Leah had her picture taken after talking dental with her new friends of Sugar Fix Dental Loft. On the final day of the Midwinter Meeting, Leah witnessed three live dental surgeries that were broadcast live over the internet! Following this once in a lifetime experience, Leah attended a lecture where she brushed-up on her guest experience skills, which is one of our big objectives here at Sugar Fix Dental Loft. 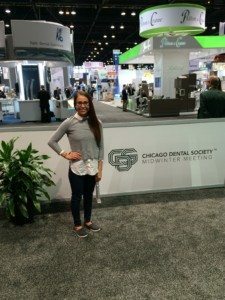 For Sugar Fix Dental Loft’s newest addition, Leah, The Chicago Dental Society’s Midwinter Meeting was a fun-filled learning experience!